Here are the best lenses for the Canon 77D, an amazing entry-level DSLR. The Canon 77D sports a 24.2-megapixel APS-C sensor with 45 AF points and an accurate Dual Pixel CMOS AF with phase-detection. If you are a new user or in touch for this lightweight DSLR. You have only need to find the best or the right lenses. 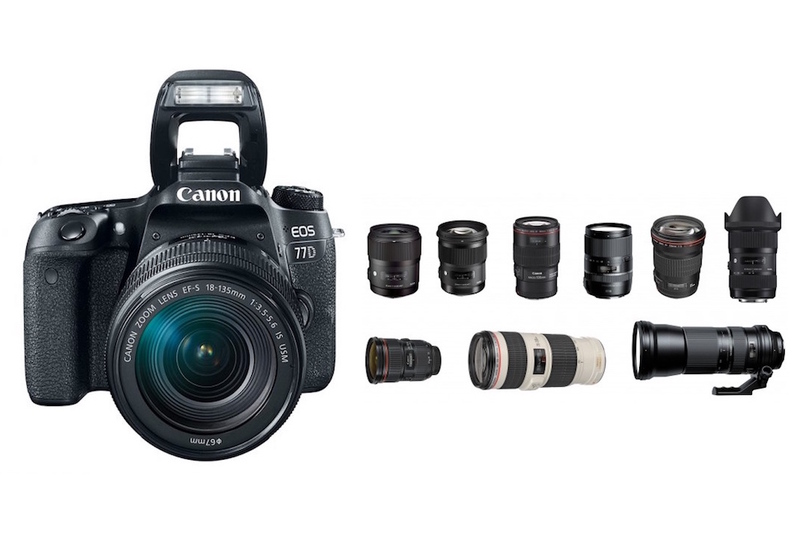 Take a look at our best lenses for Canon 77D camera. We have covered all lenses from Canon and other third-party companies and selected the best choices based on good price, usefulness and high image quality. Below are the top recommended and best Canon 77D lenses that are excellent for both complete amateurs and highly advanced photographers. You can choose the one you need. Canon EF-S 18-200mm f/3.5-5.6 IS ($699): The Canon EF-S 18-200mm f/3.5-5.6 IS is a very popular all-in-one compact and lightweight zoom lens for APS-C sized sensor DSLRs. Excellent high-speed performance at an affordable price. Sigma 18-300mm f/3.5-6.3 DC OS ($499): With a 16.6x zoom ratio covering focal lengths from wide to telephoto, the Sigma 18-300mm f/3.5-6.3 DC MACRO OS HSM Contemporary lens is an excellent all-in-one zoom. On Canon 77D it provides an extremely versatile focal length equivalent of 28.8-480mm. Canon EF 40mm f/2.8 STM ($179): The Canon EF 40mm f/2.8 STM lens is our most recommended and also the best selling Canon lens. It’s very cheap, small and lightweight. It can produce exceptional images with almost no distortion. Canon EF 50mm f/1.4 USM ($399): Canon EF 50mm f/1.4 USM is very popular and it is one of the best portrait lenses for professional photographers as well as also suitable for street photography. Canon EF 100mm f/2.8 Macro USM ($599): The Canon EF 100mm f/2.8 Macro lens will focus over the full range from infinity to true life size (1:1 reproduction ratio) macro. Ideal for photographing details, animals and small subject material. Canon EF-S 60mm f/2.8 Macro USM ($399): Amazing Macro lens that is made for APS-C cameras like the T7i. It is a lightweight and affordable macro with razor sharp optics. Samyang 14mm f/2.8 IF ED UMC ($299): Budget option. The Samyang 14mm f/2.8 IF ED UMC len is the highest quality affordably priced 14mm Ultra-Wide Angle lens on the market. Canon EF-S 10-18mm f/4.5-5.6 IS STM ($299): Great wide-angle lens with affordable price! It can deliver reliable, speedy and quiet wide-angle performance, making it an ideal lens for landscape, architecture or real estate photography. Tokina 11-16mm F/2.8 ATX Pro DX II ($469): Budget-lens with great image quality. The Tokina AT-X 11-16mm f/2.8 PRO DX II ultra wide-angle zoom has a bright constant F2.8 aperture make viewing and auto focus possible in lower light situations. This would be the best option for new Canon 77D users who are interested in landscape photography. Sigma 18-35mm f/1.8 DC HSM Art ($799): Highly recommended lens to buy for Canon 77D. The Sigma 18-35mm 1.8 DC HSM Art lens is a new benchmark in photographic history. It is the first wide-angle to standard zoom lens to achieve a large aperture of 1.8. The Sigma 18-35mm f/1.8 Art is ideal for landscapes, portraits, still life, snap shots, casual, and close-up photography. Canon 55-250mm f/4-5.6 IS STM ($299): This will be your best choice for photographing wildlife, sports, races and action with the T7i. Compact and lightweight with Optical Image Stabilizer for up to 3.5* equivalent stops of shake correction. Canon EF 70-300mm f/4-5.6 IS USM ($649): If you are looking for an affordable glass with great tele performance, this is the lens you need. The EF 70-300mm f/4-5.6 has Canon’s “Super Spectra” lens coatings for ideal flare-resistance, and is ideal for travel, sports, and general photographic applications.